The CAVE2 system is a next-generation, large-scale, virtual environment--a room in which images are seamlessly displayed so as to immerse an observer in a cyber world of 3-D data. 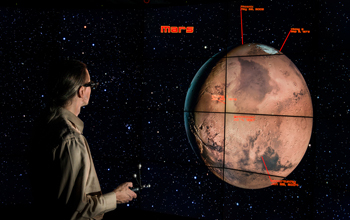 Here, individuals standing in the CAVE2 system interactively fly around a 3-D representation of Mars--originally created by Electronic Visualization Laboratory (EVL) graduate Robert Kooima with data from the NASA Mars Global Surveyor and Viking missions--and fly through star data from the European Space Agency Hipparcos mission. Kooima's Electro software was used to display the 3-D model in the CAVE2 system. EVL is located at the University of Illinois at Chicago. To support convergence research, NSF will need to address the key technical, organizational and logistical challenges that currently hinder truly transdisciplinary research. This involves a critical look at criteria and metrics, and adapting the merit review process to represent the broad expertise needed to review and identify the best ideas. NSF recognizes that the convergence of disciplines is a process. The Foundation seeks to promote convergent approaches among teams having varying degrees of integration among their disciplines, and at varying stages of readiness to adopt a convergence strategy. The key considerations are the potential for advancing a compelling research challenge that requires a novel and deep integration of expertise, and evidence that the proposed activities will develop convergence. Some of the key characteristics of convergence research projects are outlined below. Need for a convergent approach: A convergence project should make a compelling argument for why it is essential to bring together substantially different science and engineering disciplines to address a specific scientific challenge or social problem. The extent of disciplinary diversity may be assessed by the history of intellectual traditions; the development of different tools, techniques, and approaches; and the various venues for publication. Readiness to engage in convergence research: In order to make significant progress, the research team would need to provide evidence of readiness to engage in the proposed convergence research while simultaneously also representing different disciplines. Evidence for readiness might include previous interdisciplinary projects, joint publications of the PIs and co-PIs, specialized knowledge residing in the research team that is pertinent to the problem, and/or co-development of research infrastructure. Planning grants may be given to help teams to engage in convergence research. Integration of knowledge, tools, and modes of thinking: A convergence project should make a compelling case for the depth of integration of knowledge bases in the contributing disciplines; it should demonstrate strong coupling, high leveraging, and/or co-development of integrated and/or beneficially complementary tools and techniques from the contributing disciplines; and it should demonstrate novelty of the integrated research approach resulting from combinations of modes of thinking that are characteristic to the contributing disciplines. Involvement of the next generation of convergence researchers: Convergence projects are encouraged to provide new learning and experiences to undergraduate students, graduate students, and/or postdocs that would help prepare them to become the next generation of convergence researchers What roles will they play in learning to use new tools, instruments, and techniques that are central to convergence research? What concepts will they need to learn outside of their own disciplinary specialties, and how? Will the project provide new model learning environments that can be adapted in other convergence research projects?